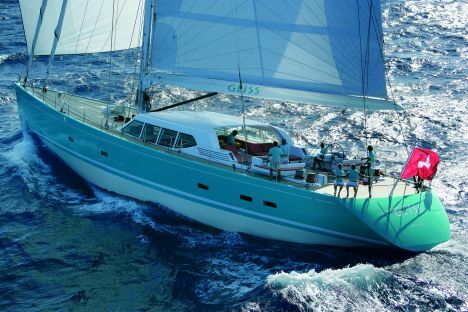 After the sea tests in July 2006, Gliss was delivered to her Swiss owner who, envisaging a suitable yacht for the cruises he wanted to make and is now experiencing, had asked the famous Dutch yard for a GT vessel, and what's more a sailboat. computerised command and control system by Schneider Electric in network with sound alarms and onboard apparatus check. For further information contact Royal Huisman, Flevoweg 1, 8325 PA Vollenhove - Holland; tel. 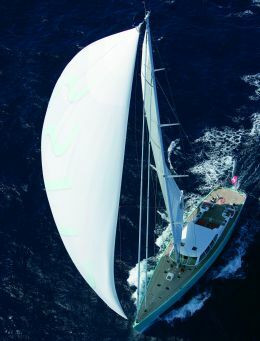 +31 527 24 3131; fax +31 527 24 3800; email yachts@royalhuisman.com; website www.royalhuisman.com. The parallel may seem at the least a distortion of meanings, but actually the owner employed these terms with the designers: he was after a performing vessel that could satisfactorily tackle ocean racing and at the same time be comfortable and welcoming for the most demanding cruises. In fact this is another example of a cruise/race yacht, boats that make a strongpoint of their multifaceted use while maintaining high standards of comfort and performance. This of course is all possible today thanks to the advent of materials and work processes by which we can create vessels of limited weight that can face very high stress levels. A great number of shipyards have got into this type of production, just as many designers seek to achieve maximum comfort and performance from hulls that can be created and fitted out today with technological materials of high mechanical efficiency but of reduced weight. In the case of Gliss the naval architect was Philip Briand, aided with the powerful rig by the Rigged Performance Sailing Sloop company, experts in the racing sector. Before giving a description of the yacht we'd like to tell readers about our sensations on the occasion of a sail aboard Gliss. After the tuning that follows the first sea tests of such yachts, we were invited to be Royal Huisman's guests for a whole day's sailing, first with little wind and later with a fresh breeze. We also had the pleasure of steering her personally, appreciating the sensitivity of the helm which responded as if she were a smaller craft. Moreover, we were impressed by the vessel's rapid pickup speed both with little wind and then with a fresh breeze. The powerful sail plan makes the boat react immediately and every trimming operation results in rapid motion. The deck is organized in such a way that a skeleton crew can handle all the running rigging, with the aid of electric winches and controls effected directly from the two wheelhouses in the cockpit. Indubitably Gliss is a boat designed by a racing lover for someone who intends to race her. Observing this yacht there are many technical choices that express her sporty nature. For example, if we analyse the underwater appendages we find technical solutions like a keel with a trim tab, which is to say the possibility of modifying the outgoing flow profiles generated by the appendage. The same system is used on America's Cup yachts and offers the possibility of maximum exploitation of the hull's potential, especially when close hauled, so you can sail in optimal trim. But let's get down to a description of this yacht which, like every Royal Huisman creation, is a one-off piece wholly built in every detail within the Dutch yard. It is however true in this case that the owner asked for Lewmar deck gear rather than the usual Royal Huisman Rondal, since he'd been satisfied with Lewmar on his previous yacht. 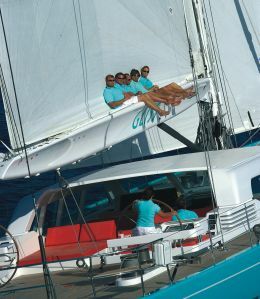 At first glance the colour of the hull arouses curiosity: turquoise, certainly original for a yacht of this size. We don't know why this choice was made but the effect even from a distance has a certain impact. As we said earlier, Gliss was created with the aim of being a performer, and we found out that this objective has been amply achieved, but also with the aim of being an ideal long range cruiser both in the Mediterranean and on the ocean. 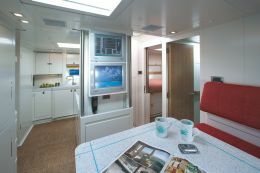 This is why the deck plan is clean and rich in devices that are evidently designed for someone who really lives a racing life at sea: retractable cleats, flush skylights, embedded sundecks; in a word, a real flush deck when under conditions of use. As for the interiors, designer Pieter Beeldsnijder, in accordance with the owner's taste, has created practical spaces characterised by soft lines. The predominant wood selected is whitened oak, with a great number of custom made accessories in nickel and black granite, and with furnishings in red and bright yellow. 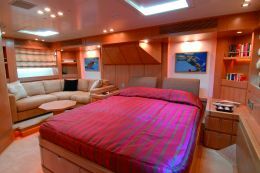 There are four cabins, one of which is the owner's suite aft, running the whole width of the beam, with living room, dressing room and spacious bathroom. Then there is a cabin with double bed and private bathroom, and a twin bed cabin, also with private bathroom. Slightly forward of the amidships area the technical room, which stretches the whole width of the beam, houses all the onboard systems, easily inspected thanks to the ample space available. 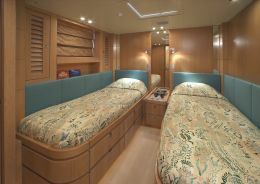 Farther forward is the fourth guest cabin, with single bed, and the crew's quarters including a dinette with table and sofa, a mess room facing the galley, a double and a single cabin and two bathrooms. 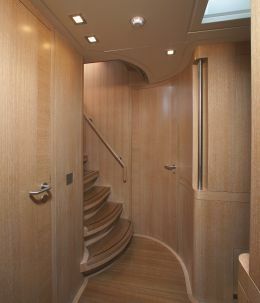 It should be pointed out that the lower deck also has a service bathroom, an unusual choice on a sailboat of this size but certainly handy for the guests who can access it by a stairway directly from the saloon. The spacious saloon in the deckhouse has two facing sofas and tables, forward of which is the command bridge on the starboard side, with no classic steering gear since everything is handled by electromechanical aids, and with a chart table and double seating. The electrically controlled windows of the superstructure is an interesting solution. They retract into the hull, allowing a very pleasant circulation of air when at anchor in the sun, and supply an alternative to the available air conditioning. Aft of the structure just described there are two spacious sundecks, separated in the middle by a gangway between the saloon and the cockpit, the latter equipped with twin command stations complete with all the instruments for controlling both mechanical apparatus and the powerful sail plan. Another element noteworthy for its structure is the bathing platform which is obtained by overturning the transom, thus leaving plenty manoeuvring space for the tender and the various sea toys such as jet skis, windsurfing boards etc. The bathing platform is in teak faced carbon, making it pleasant to walk on, and is handled by an electric control on deck. Of course among the accessories purpose-built for Gliss - practically all the elements on board except electronics and engine - there are various details created by Rondal, though as we said the spars are by Marten Spars, with carbon mast and boom, and the winches by Lewmar. 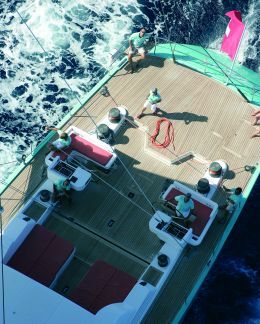 But the blocks are the first of Rondal's "Air" series, the latest generation of deck accessories from this company owned by Royal Huisman. Rondal also supplied numerous deck accessories such as bitts, fairleads and other elements specially designed for Gliss.